I distinctly remember being a young teenager, struggling to catch my first Jewfish (also known as Mulloway) and being totally confused by the amount of information (or is that dis-information?) available regarding how to catch these wonderful fish. Consistently catching Jewfish is in itself a fairly easy task once you’ve managed to get your local estuary wired, the hard part is actually putting all the pieces of the puzzle together. The information I impart in this article can help you achieve frequent success in solving this puzzle if applied consistently and with dedication. While there are numerous techniques allowing anglers to connect to a solid Jewfish, this article deals specifically with fishing live baits, a method which I believe consistently produces more Jewfish than any other technique. Jewfish can be caught year round, however, it is in winter and early autumn when the action is the most consistent. This means less time spent watching for shooting stars, and more time spent with your heart in mouth, while nervous live bait twitches and panics on the end of your line. This increase in Jewfish activity can be attributed to two main factors. Firstly, there are the large amounts of Bream, Mullet, Tailor and Blackfish (luderick) migrating along surf beaches and headlands, and spawning in the lower reaches of the estuary systems. These fish form a crucial part of the Jewfish diet and are the main reason large Jewfish leave their abodes of rocky headlands and offshore reef systems, to enter the estuaries and feed on these migrating species. Secondly, unlike summer and spring, when the biggest tide of a 12 hour tide cycle occurs during the morning, in autumn the afternoon/evening high tide consistently increases in size, peaking at close to two meters in height late at night in the middle of winter. 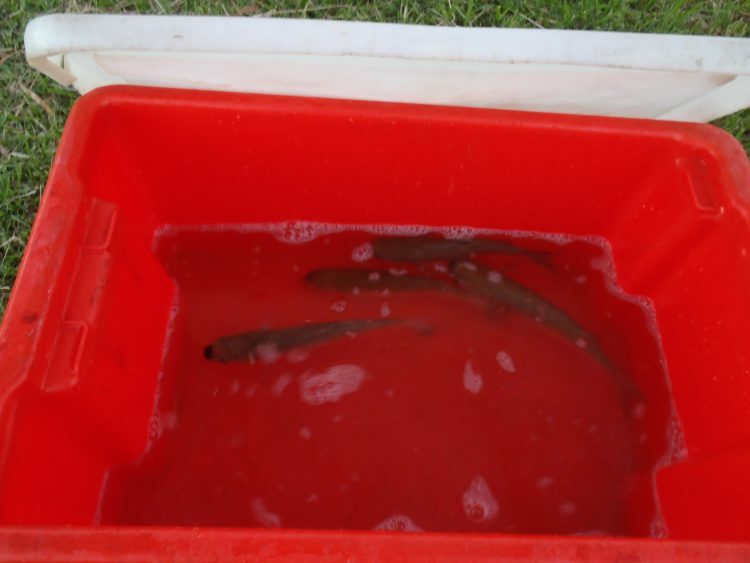 The substantial amounts of baitfish (though it is hard to call a 1kg Mullet or Tailor a baitfish) and large nocturnal tides create ideal feeding conditions for Jewfish in the estuary, that is not found at any other time of the year. Local folklore identifies Anzac day in April as the start of the Mullet run in northern NSW and this also marks the start of the season for catching estuary Jewfish. From this date onwards large schools of mullet can be seen like black shadows moving up and down the estuary with the tide, the Jewfish never far behind. The Jewfish season tends to peak during the winter months when these migrating Mullet, Tailor and Blackfish are most abundant. It is on these chilly nights when the most and biggest fish are generally caught. Gradually, the numbers of Jewfish caught tapers off as the migrating Mullet finish their spawning run and exit the river, in September and early October. Big Jewfish are very efficient (some would say lazy) predators. Ideally, they prefer deep water locations, with the magic depth mark seeming to be in excess of six meters. Couple this with a back eddy out of any strong current flow, a significant drop off, and abundant supplies of Mullet or chopper Tailor for them to ambush, and you have an ideal location to find Jewfish. Many locations that produce Jewfish are common knowledge, and a few questions at the local tackle shop will often give you a rough idea of where to start looking. If you have access to a boat, or even better a keen friend with a boat, the process of sounding out a suitable Jewfish location can be made a lot easier, but there are three general locations that can be easily identified in every estuary system. The most obvious location to find Jewfish may be the numerous breakwalls in estuary systems throughout northern NSW and south-east Queensland, that allow access to the open sea. These breakwalls are often deep, with strong tidal flow, and structure in the form of boulders and concrete blocks that litter the base of the wall below the water line. The entrance to the river often acts as a fish highway with strong tidal flow, and Mulloway prefer to sit out of the current behind sunken boulders, and ambush any hapless baitfish that is unlucky enough to be swept past. The nature of these areas necessitate the use of strong tackle and a dependable mate to gaff your fish and help lug equipment buckets of live baits along the rock wall. Breakwalls have limited fishing time due to the extreme tidal flow, but they are easy to locate and consistently produce quality fish. Deep estuary holes are also prime producers of Jewfish. The first major hole in from the entrance of the river is often a very consistent producer of Jewfish, with this hole often being one of the deepest in the system, in excess of ten meters in many cases. Recent satellite tracking of estuary Jewfish in the Clyde River on the NSW south coast showed that Jewfish travel between significant holes in an estuary system using them for both resting and feeding during tidal cycles. These holes are often best located and fished from a boat, though many times, once a hole has been located and sounded out it can also be accessed from the shore. The best producing holes always tend to be flanked by a steep rocky shore with an obvious substantial drop off. On still winter nights it is possible to see Jewfish ploughing through the Mullet, which are trying to hide, tucked up tight against this shoreline, sending Mullet showering everywhere like live confetti! Exciting stuff to watch, especially when your live bait is right in the middle of it! The last common Jewfish producing location will be any major bridge that crosses the estuary in the lower reaches. 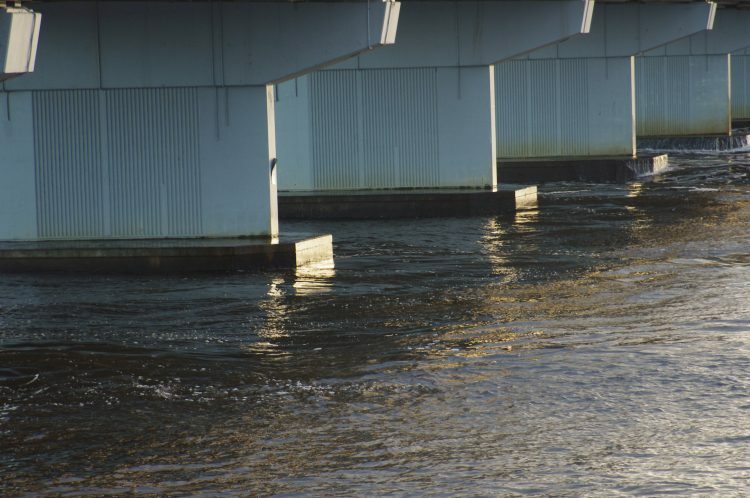 Ideally, this bridge will feature deep water, structure in the form of bridge pylons, and an abundance of baitfish attracted by the overhead lighting. The overhead lighting allows Jewfish to ambush baitfish in the line between the dark and illuminated water and also comes in handy when rigging up, playing and landing fish. The ideal spot to fish a nervous live bait is behind a pylon and out of the current flow, as this is where the Jewfish will be sitting, waiting to ambush baitfish — just be careful they don’t wrap you around that same pylon! On the top of the tide, when there is little or no current, Jewfish will leave the pylons to hunt and a free swimming or weighted live bait should be placed just inside the dark water and out of the light, where, with a bit of luck it will quickly be eaten. 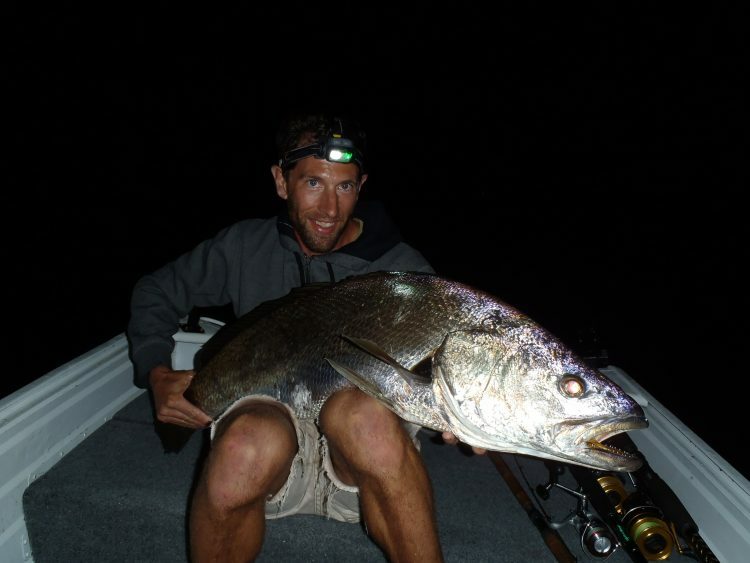 The prime tide to hook a Jewfish is any time after the sun sets, that is coupled with the appropriate high tide. While this statement isn’t exactly surprising there are quite a few variables to this. Looking back at my fishing diaries from many years ago, I fished any and every high tide after dark in autumn and winter. One of the most important variables affecting success in catching estuary Jewfish is boat traffic, as the sound of a boat engine travels a long distance under water. Jewfish are incredibly shy creatures and constant boat traffic tends to make them uncomfortable. Frequently, we have been in the midst of a hot Jewfish bite with fish being lost or landed, and a boat driving past the location we have been fishing has seen all activity cease as suddenly as flicking a light switch off. High tides late at night, and preferably on a weekday, see less boat traffic and consequently more fish being caught. When anchoring up it is often prudent to slow down one hundred meters from your chosen location and carefully motor to your anchoring spot. If you can use an electric motor to silently glide into position, it’s even better. Taking this information into account, please be considerate driving past fisherman on the shore fishing in known jewfish locations, as one inconsiderate boat owner can ruin a whole nights fishing. While it is possible to catch Jewfish on smaller tides, in my experience high tides above 1.4 meters are substantially more productive. I believe this is due to both the volume of water, which allows both the migrating Mullet and any Jewfish to confidently enter the estuary from the beaches and headlands under the cover of darkness, and the fact that tides higher than 1.4m occur later at night when there is less boat traffic. In my early Jewfish endeavours a Saturday night tide of less than 1.4M often meant high tide between 6pm to 8pm, lots of boats on the water, and consequently it was rare that I caught anything. However, a Tuesday night high tide between 10pm to 12pm was an opportunity not to be wasted. Jewfish will frequently bite within thirty minutes of the tide changing and ideally you should plan to fish the last hour of the run-in, the top of the tide, and the first hour of the run-out tide. I often plan weeks in advance which tides I am going to fish using Smartphone App’s such as Seabreeze and Pocket Weather, which provide easily accessible and accurate tide charts. Just remember to factor in the lag time for the high tide the further you fish up river. As I mentioned earlier, Jewfish are extremely shy creatures, they instinctively dislike loud noise underwater and this also applies to bright light. Years of catching Jewfish have reinforced my belief that as far as moon phases go, the dark of the moon is the best time to catch Jewfish. The large tides around this moon phase, coupled with the pitch black conditions, encourage Jewfish to feed aggressively. If it’s overcast, windy or rainy, even better. In fact, experience has shown that the worse the weather the better the fishing, and I will happily fish in anything up to a 30 knot southerly gale. Consistently catching Jewfish is rarely the domain of fair weather fisherman. The unspoken question is “what about the full moon?” I have caught Jewfish on the full moon but with most full moons providing enough light to read a newspaper, these occasions have been few and far between. The nights catch normally consists of sharks, rays, and live baits being mercilessly tormented by Bream. There is an exception to this rule. It involves wind, rain and cloud cover. If a decent storm or heavy cloud cover cancels out the light of the moon I will happily fish with confidence. The important thing is to get rid of that light so the Jewfish can feed comfortably. The beauty of this style of fishing is that you don’t need to own state-of-the art fishing equipment to catch fish, though it can make your life easier, it’s definitely not necessary. In fact, tackle and rigs for Jewfish are the least complicated part of the equation, regardless of make and model. any reel with a strong drag system and the ability to hold at least 250m of 10-15kg line will be able to handle even the biggest of estuary Jewfish. In terms of line to fill this reel, the debate rages over braid vs. monofilament line and each has its adherents. I personally use 15kg mono on all my reels due to its abrasion resistance, the stretch of the line preventing pulled hooks, and the belief that the sensitivity of braid is felt by Jewfish on the other end of the line, causing dropped baits and missed fish. However, I know fisherman who consistently use braid with success on Jewfish and as such I will leave the choice up to you. As far as rods go, 7 foot boat rods rated 10-15kg will stand you in good stead with similarly heavy surf rods perfect for shore based fishing to achieve extra casting distance and steer fish around structure. For the majority of live baiting a basic running sinker rig is used. This consists of a size 6-8 ball sinker connected to a swivel and half a meter of 23kg (50lb) fluorocarbon trace with a razor sharp 8/0 Gamakatsu Octopus. This is by far my favourite hook for live baiting and I have never had one fail on me. 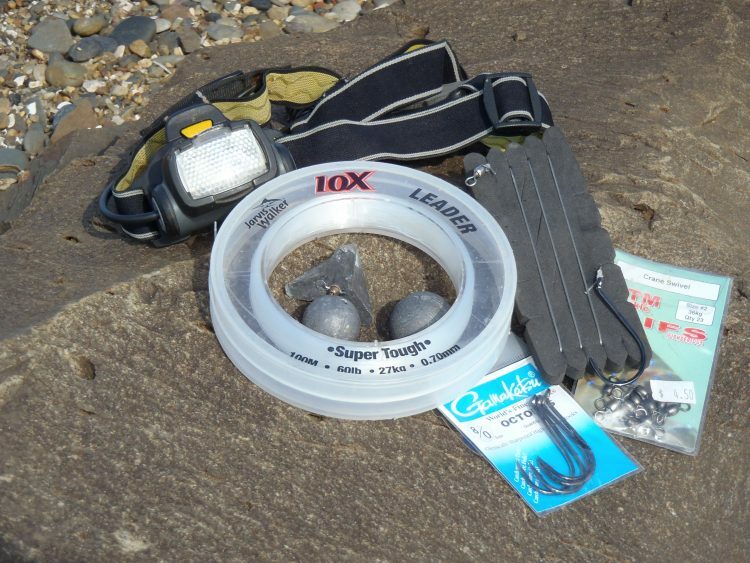 I also carry a few star sinkers to use during strong tidal flow. Minus the sinker, this same rig is used at slack water to swim a mullet out on the top of the tide or to lob a live bait into a school of mullet being harassed by Jewfish. When fishing from the shore with an unweighted live bait the mullet will attempt to swim back to the safety of the shoreline, attempting to get as close to dry land as possible and out of the path of a hungry Jewfish. The technique used here is to throw the live bait as far from shore as possible and slowly wind it in as the mullet swims towards you. The take of a Jewfish on live bait is quite distinctive and is often heralded by increasingly nervous and anxious live bait tugging and pulling at the line, which then quickly seems to grow in size as a Jewfish grabs the bait and heads off at a frantic pace into the darkness. Unlike fishing with dead baits, Jewfish rarely muck around with live baits. After years of free spooling, feeding slack line, and waiting for the so called ‘second run’ with many missed fish, I now simply hold my rod high at almost 12 o’clock, point the rod tip towards the fish as it swims away, raise the rod as the line goes tight, and then hold on for that first screaming run. If the bait is in the Mulloways mouth, so is the hook. Dropping the rod tip towards the fish gives it enough line to start swallowing the bait before driving the hook home. It’s that simple. I often wonder these days how I managed to pass university, being so consistently sleep deprived during my early Jewfish fishing sojourns. I fished known locations and had the odd success; just enough to keep me motivated, but it took a couple of years fishing for a clear pattern to emerge. I would recommend every novice Jewfish fisherman (and even the experienced ones) keep a fishing diary of some sort, recording factors such as tide height, moon phase, boat traffic, water clarity, bait, tackle, and rigs used and if any fish were caught or lost. The information you put into this diary only shows its value after the first year of consistent and serious fishing, when you can try to emulate your successes of the previous year. The most important thing in a fishing diary is to put down information from every trip, especially the trips that were slow or where you didn’t catch anything. This will allow you to plan your future fishing trips for the optimal conditions and hopefully keep you a bit saner and the wife/girlfriend a little happier. Looking back at my original diary I averaged a Jewfish catch every fifteen trips when I started fishing. Thanks to these past fishing diaries that number has now jumped significantly, to the point where I can confidently expect to catch a Jewfish every three trips.